Opposing Forces is a shooter with a twist, demanding the use of tactics over fast reflexes, although you’ll still need them. This free PC game earned an Honorable Mention in the 2011 Independent Propeller Awards and by playing it’s easy to see why. 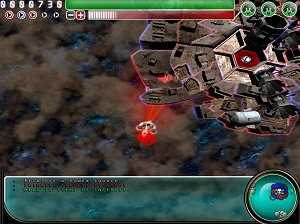 The small vessel that the player controls has to clean the area of debris, but suddenly has to overcome a more arduous task – that of destroying relentless enemies without firing a single shot! To do this we must bring into play the magnetic manipulators of our ship and use the debris as our ammo. By attracting or repelling the debris we will damage the enemy ships, sometimes even using their own weapons against themselves. The colorful and polished visuals are another high point of this clever game.